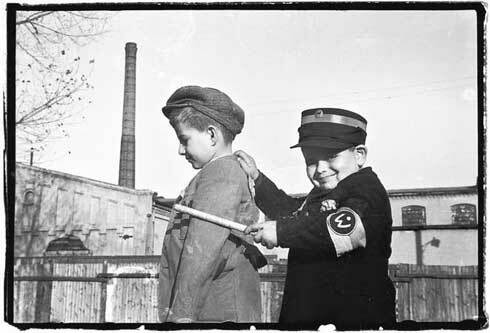 Mendel Grossman was a Jewish photographer in the Lodz (Litzmannstadt) ghetto, born in 1913. He was a slim man of less than average height with sloping shoulders, his coat hanging on him as if it were not cut to his size, even his shoes appearing too large for him. His eyes expressed goodness, a clever smile played on his lips, his steps were measured and he always carried a stuffed briefcase. That was Mendel Grossman, a young man of a Hasidic family, the type of a former Talmudic student who had left the straight and narrow path. He was avid for knowledge, a lover of literature, the theatre and the arts, a painter, a sculptor, and also an amateur photographer who believed that photography was an art. His photographs flowers, still-life, landscapes, street scenes, portraits, taken against the background of clouds, were works of art filled with expression, leaving strong impressions on the viewer. Eventually Mendel Grossman began to concentrate on one subject – man in motion. The transition came abruptly, and by accident. The Habimah theatre was visiting Lodz and Mendel hidden in the wings, photographed the performances. No one asked him to do it he did it for himself alone. Here were men and women in motion, in classical motion there was dancing, varied and strange facial expressions, laughter, fear, pain, as well as make-up, costumes, light, stage settings. When later he locked himself in his darkroom to develop the films he was astonished by the power of his photographs, he actually succeeded in arresting men in motion. All those who saw the pictures extolled their excellence, but Mendel knew that he was only at the beginning of this particular journey. Habimah left, and Mendel directed his lens to the street, to the suburbs inhabited by Jews, the slums. He now found motion and expression not on the stage, but in the streets, among children playing, labourers at work in the Jewish quarter of Baluty. His photographs gained a measure of respect, and Mendel achieved recognition as an artist- photographer. In the beginning of 1939, the management of TOZ, the Jewish organisation for the protection of children’s health, approached him with an attractive proposition – to prepare an album of pictures of Jewish children. The accent was to be on the poor Jewish child in the streets. Mendel enthusiastically accepted the proposition and was soon ready with a series of photographs. It was the summer of 1939, the album never appeared and the photographs got lost in the war, and at the same time so did their subjects the Jewish child. The idyllic life of discussions on art ceased with the outbreak of war and the first contact with a brutal occupier, then the Star of David to denote a Jew, and the creation of ghettos. Mendel was ready with his camera. No longer did he photograph flowers, clouds, still life’s and landscapes. 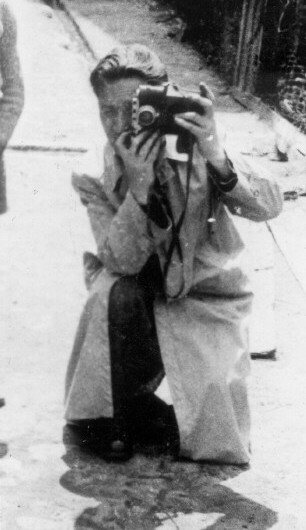 In the horror of the Lodz ghetto he had found his mission, to photograph and thus record the great tragedy taking place in the ghetto before his eyes. Mendel Grossman knew how to photograph, he knew how to observe and perceive what happened around him, and what is most important – he saw the people surrounding him. He photographed them in their suffering, as they sank into the depths of pain, in their struggles, in their illnesses, and in their death. He recorded with his camera what took place in the tortured ghetto, the Holocaust at its intensity. He gave up his artistic ambitions of the past, his mission was now clear, to leave to the world – if a world was to remain – a tangible testimony of the great tragedy, of the horrible crime, in a language understood by all nations. Evicted from his house in the centre of town, Mendel found a flat in the ghetto where he settled with his parents, two sisters, brother –in-law and little nephew. The story of his family is typical of Jewish families in Lodz. Mendel realised this, and intensively photographed his loved ones, so that over the years he created a horrifying record of their slow progress toward death. Mendel obtained a job in the photographic laboratory of the department of statistics in the ghetto, the office in which all the true information concerning the ghetto was collected. Covered by its official status, the staff of the department accumulated written material. They did not only record dry facts, as statisticians usually do, but wrote down every rumour passing through the ghetto, every change in the distribution of food rations, every event no matter how unimportant. They also collected photographs, ostensibly to demonstrate models of products of the ghetto workshops, and identification photographs for work permits. The laboratory had a good supply of film and printing paper, and also served as an ideal camouflage for Mendel’s real job. 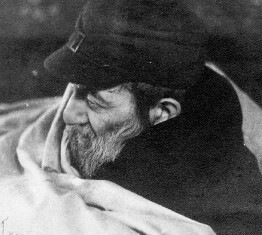 He spent most of his time in the streets, in the narrow alleys, in homes, in soup kitchens, in bread lines, in workshops, at the cemetery. The chief subject was people. He did not seek beauty, for there was no beauty in the ghetto, there were children bloated with hunger, eyes searching for a crust of bread, living “death notices” as those near death, but still on their feet were called in ghetto slang. He photographed conveys of men and women condemned to death in the gas-vans of Chelmno, public executions, in one incident, a whole family passed through the street dragging a wagon filled with excrement, a father, mother, son and daughter, the parents in front pulling, and the children pushing from the sides. Mendel had heart trouble and he was forbidden to make any physical effort. The Gestapo was also on his tracks and his friends warned him, his family insisted that he stop endangering his life. But he did not heed any warnings, no event in the ghetto passed without him photographing it. To fool the police he carried his camera under his coat. He kept his hands in his pockets, which were cut open inside, and he thus could manipulate the camera. He directed the lens by turning his body in the direction he wanted, then slightly parted his coat, and clicked the shutter. This method worked very well. 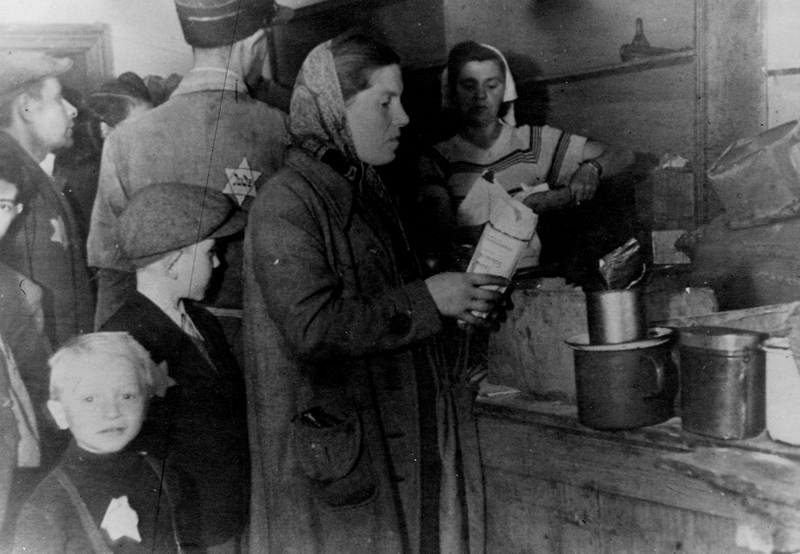 In one of the stages of the destruction of the Jewish people the Germans deported the remnants of the Jewish communities of Germany, Austria, Czechoslovakia and Luxemburg, and brought them to the Lodz ghetto. Mendel received the arrivals with camera in hand. Here were characters of a new kind, with a different appearance, different manners. They were well dressed, they carried heavy suitcases, were well provided with food. They were horror stricken at the sight of the ghetto, they refused contact with the old inhabitants of the ghetto whose appearance repelled them. They tried to swim against the current and quickly gave up, they collapsed spiritually and physically. Mendel and his camera followed this process which ended when the Germans collected the pitiful remnants and again loaded them onto trains, this time the trains were bound for Chelmno. Mendel after taking a long distance photo, hidden in a room overlooking Bazarny Square of an execution of a Jew from Vienna, who had been arrested outside of the ghetto, was able to photograph another execution close up. On a cloudy day he again ventured out with his camera this time to an open field on Marysinska Street. Unlike the first time, Mendel did not take up a protected position, but stood behind a German policeman, in the front row of the crowd. As usual the camera was suspended from a strap around his neck, the coat was slightly parted, and his hands under the coat directed the lens to the scaffold. The condemned young man, was brought in a cart. He still did not realise what was going to happen to him. He noticed at first a large crowd, and then the dangling noose. Now he knew. Without uttering a sound he ascended the scaffold, his head down. The crowd held its breath, the distant cries of the condemned man’s wife also ceased. 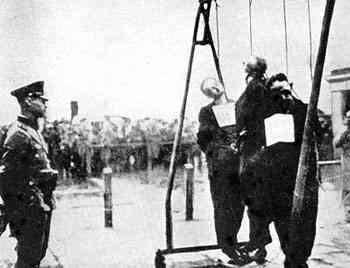 The German’s were tense as the hangman tightened the noose around the victim’s neck. Mendel clicked the shutter, the silence was so absolute that even this muted sound reached the ears of a German policeman, and he turned his head. Pale with excitement, Mendel returned to the small darkroom in his flat to develop the picture. This time the photograph was clear in every detail. 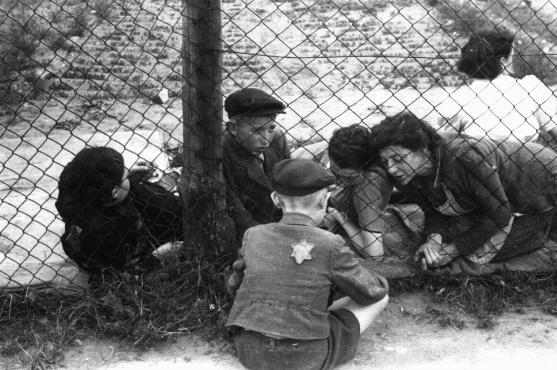 Still Mendel thought that he should change his technique, from then on he climbed electric power posts to photograph a convoy of deportees on their way to the trains, he walked roofs, climbed the steeple of a church that remained within the confines of the ghetto in order to photograph a change of guard at the barbed-wire fence. Weak and sick, he found it difficult to accomplish all those feats, but he was contemptuous of danger and did not heed the pleadings of friends. Inside the church he discovered a strange world – a surrealistic picture which could be only the product of morbid fantasy – the entire interior was covered with a thick layer of white feathers. Waves of feathers rose into the air with each step, each movement. Every breeze caused a cloud of feathers to form in the air. The altar of carved wood, the figures of the saints, and the huge organ – all were covered with feathers, all undulated in the breeze. Amidst all that he saw human figures, also wrapped in white, sitting, running around, standing. A small sign attached to the entrance attempted to explain what was happening inside. It read Institute for Feather Cleaning, but the sign did not tell the whole truth. The Church was the place to which the bedding robbed from Jews who were sent to death from Lodz and surrounding towns was being brought. There, in the Church of the Virgin Mary, the pillows and featherbeds were ripped open by Jewish men and women, then the feathers were cleaned, sorted, packed and shipped to Germany, to merchants who sold them in the Reich. Mendel spent many weeks in the church, covered with feathers. He looked for varied angles which would fully explain to future generations what was happening in that church. He created evidence of the crime, the full extent of which was not yet known to him. Only his intuition told him that this must be recorded. The collection of negatives grew from day to day its contents became richer and more varied. The negatives were hidden in round tin cans, among them a can full of negatives from the performances of Habimah in Lodz in 1938. Mendel again and again stressed in conversations with friends that he expected those negatives eventually to reach Tel Aviv and be given to the theatre. He did not speak of the plans for the future - he only wanted his photographs to be exhibited as testimony of what took place in the ghetto. The desire to record, to record at all costs, had become part of the consciousness of the inhabitants of the ghetto. All parts of the community had become permeated by this desire, and Mendel with his camera was received with open arms and with full understanding, in workshops, in hospitals, in orphanages, in offices, in the streets. In 1942 the Germans announced a new deportation from the ghetto and the Gestapo and members of the Kripo went from house to house selecting Jews for death. Dead bodies were collected and thrown on a heap in the cemetery. Mendel decided he need to record these events, Mendel attached himself to the gravediggers and went to the cemetery, with his camera in his hand. Carts continued to bring in bodies but Mendel first turned his attention to the open mass grave, inside were deportees from the nearby town Zdunska Wola. They had died of suffocation in the tightly packed trains. Mendel managed to take photographs before the gravediggers did their job of covering the evidence. Then with his slow steps he went to the hall reserved for memorials but which was now filled with bodies. From the distance the sound of rifle fire was heard, the “aktion” continued. While photographing, Mendel marked the chests with numbers. The same numbers later appeared on the graves, and thus the families were able to identify the graves by first identifying their dead on the photographs. The head of each body was lifted by a gravedigger, and Mendel went from one to another clicking, recording the bruised, bloody, crushed faces, faces of old people, of boys, of girls. Some of the eyes were closed, some half open, some half open, some stared with fear, some exuded the serenity of death. 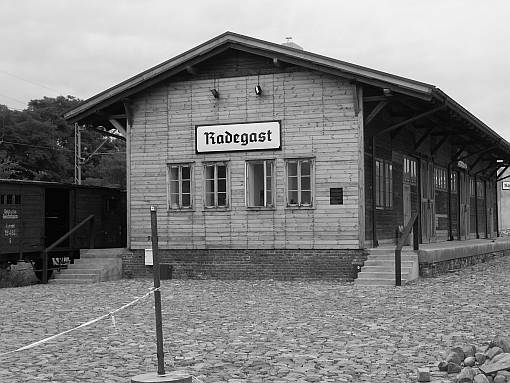 The great deportation “aktion” was about to end, Mendel still managed to photograph the large wagons full of Jews condemned to death as they made their way to the concentration places and from there to the railway station at Radegast. Again the trains rolled in the direction of Chelmno and the gas-vans and crematoria of “Sonderkommando Bothman” worked at full speed. There followed “regular” days in the ghetto, and one could find Mendel in the streets and ghetto institutions, his lens directed toward the starving and the sick who were not allowed to be sick because there was no room for them in the ghetto, and therefore all medical institutions were liquidated. They remained only in Mendel’s photographs. 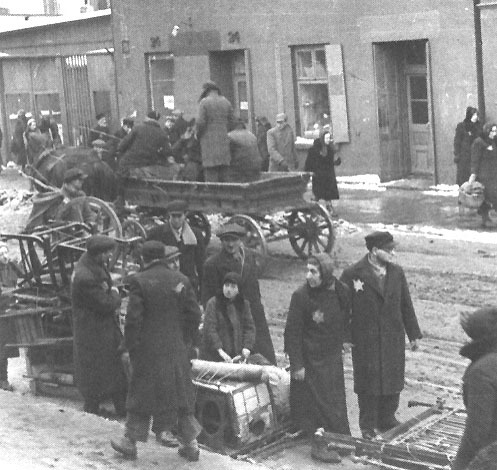 In 1943 deportations began again, the inhabitants of the ghetto still did not know to where the deportees were being taken. There were many rumours, most of them pessimistic, but some contained grains of hope. Mendel sensed that the omens were bad, he suspected the Germans of taking the deportees to a place from which there was no return. He photographed almost exclusively the convoys, the places where the deportees were concentrated, the ghetto jail. Friends warned him against photographing the convoys, because Gestapo men were among the guards, and they would find him out. Again he heeded no warnings. In one of the ghetto workshops, a telescopic lens was being secretly constructed for him according to a sketch he prepared. When completed, the lens performed satisfactorily, but was heavy and awkward to carry, Mendel was happy, because he could now photograph from a distance and from hiding places. He photographed the convoys from windows, following them until the deportees entered the death trains. 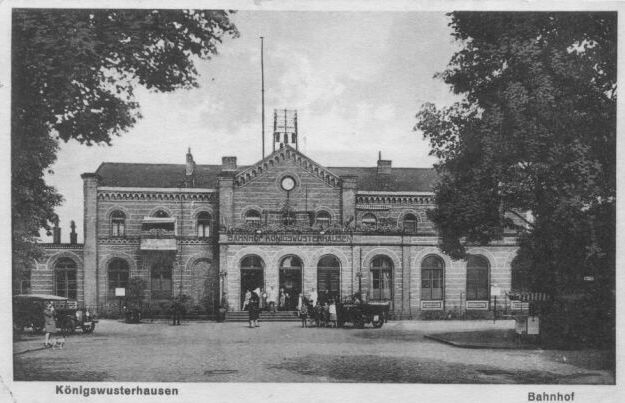 He was in great danger when photographing the railroad station with the German police pushing the Jews into the trains. He took the photographs hidden behind a stack of slabs of concrete belonging to a factory of prefabricated houses. The new lens did its work well. Mendel showed particular interest in recording the activities of youth organisations in the ghetto. He appeared at meetings, photographed events. All was open to him, the young people trusted him and Mendel discovered suddenly smiling faces, faith in the future, and care for fellow men. There were no longer orphanages and old people’s homes in the ghetto, and so he photographed the children in the workshops to which the entire population was mobilised. Mendel infiltrated the parties of the ghetto elite, photographed their shameful mode of living, which was a mockery of the sufferings of the starving population. Many of Mendel’s pictures showed the institutions of the ghetto authorities. They stressed the bitter irony of the “autonomy” given to the Jews within the barbed-wire fence, the empty paraphernalia, offices, police, parades and uniforms. He generously distributed copies of his photographs, he asked for no payments he let the pictures be kept by as many people as possible. Perhaps some would remain after the holocaust. Mendel spent his evenings locked in his darkroom, working till late at night. In the mornings he distributed prints among friends and acquaintances and kept only the negatives for himself. He kept next to his enlarging apparatus a little crystal set with an earphone which was capable of receiving only the German radio station in Lodz. Thus he was informed on the progress of the war, but he did not indulge in commenting on the subject. His drawers were full of tin cans with more than then thousand negatives, the result of hard and stubborn work since the occupation. Those cans contained the images of people whose ashes were already scattered in the forests of Chelmno. In them was the story of the suffering and destruction of a great Jewish community, the most telling proof of the greatest crime in human history. With the Red Army advancing on the eastern front, Mendel knew that he must now hide his precious negatives in a safe place. Mendel made a quick selection of negatives, packed the tin cans in a wooden crate. With the help of a friend he took out a window sill in his apartment, removed some bricks, placed the crate in the hollow, then replaced the sill. The task was accomplished. The negatives seemed safe for the future. But Mendel retained his camera. 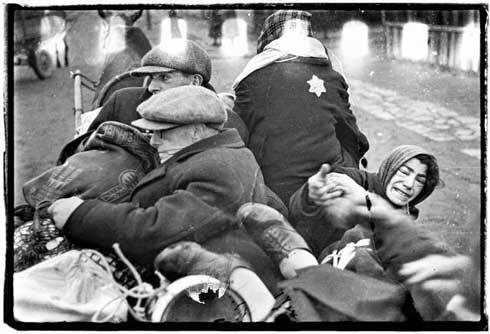 The days of the Lodz ghetto final liquidation came, there was chaos everywhere, Mendel continued to photograph to the very end. He could no longer develop the film, the ghetto was almost empty. Trains left twice a day for an unknown destination, one of the last to leave was Mendel, his camera hidden under his coat. 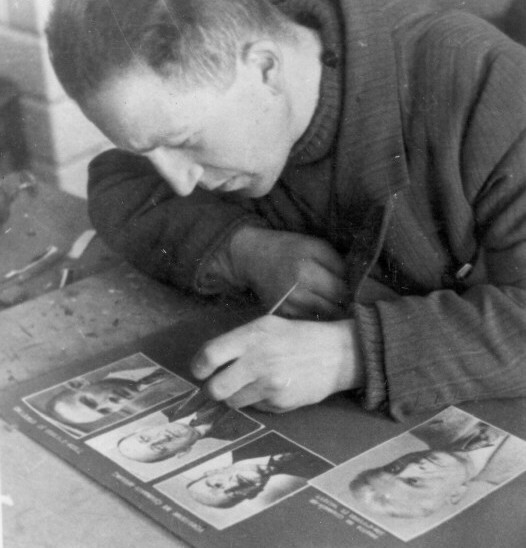 Several days later the Gestapo found out about his activities when they found in some abandoned flats prints of his photographs – the definitive proof of their own crimes. Mendel was sent to the Konigs Wusterhausen labour camp, in the Reich where he secretly continued photographing, but not developing and printing. When, the war front advanced and came closer, and the prisoners of the camp were taken out on the death march, Grossman collapsed and died with his camera on him. The negatives of his photographs hidden by him in the ghetto, were found by Mendel’s sister and sent to Israel, but most of them were lost during the War of Independence, when Egyptian troops captured the Nitzanim kibbutz. One of Mendel’s closest friends Nahman Zonabend remained in the Lodz ghetto until its liberation. 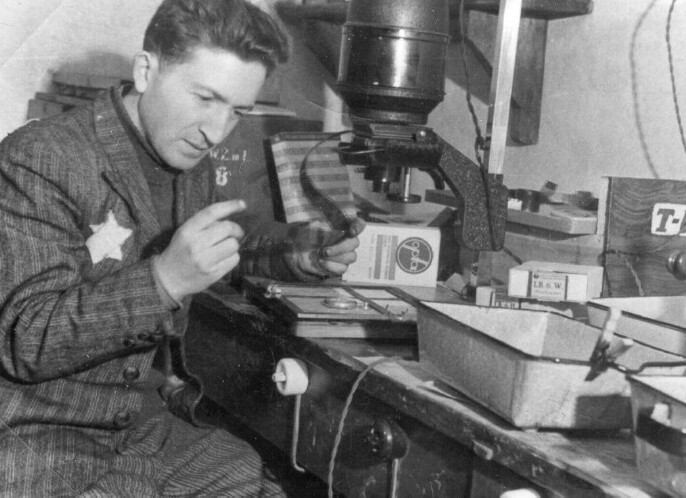 Although the Nazis kept him under constant surveillance, he succeeded in saving the archives of the Judenrat, and he concealed the documentary treasure, including some of Mendel’s photographs, at the bottom of a well. After the war this material was taken out of Poland. The archives were collected and are now housed in the Museum of Holocaust and Resistance at the Ghetto Fighters House in Kibbutz Lohamei Hagetaot Israel. Also the photographs taken by Mendel Grossman were used in the book With a Camera in the Ghetto, published in America in 1977. With A Camera in the Ghetto- Mendel Grossman, published by Schocken Books, New York, USA 1977. The Chronicle of the Lodz Ghetto 1941-44 – Edited by Lucjan Dobroszycki, published by Yale University Press, New Haven and London.